We finally saw some sunshine today. The temps also dropped a little, improving the training conditions. The mountain is beautiful, with more rime deposited on the upper rocks than I've ever seen. Scott continues to work on "stacking" over the new outside ski during transition. When it works, he's really fast. He can string 5-6 gates together and is impressed with how it feels. However, working on a new move in the race course messes up his timing, leaving him a little frustrated. It's only June... it'll come. There are two days left in this camp, then Scott flies to Park City for "Rookie Camp" where he'll learn the ins and outs of sponsors, conduct, meeting with the press, etc. I'll be staying here to attend the Level 300 Slalom coaches' clinic. We'll both be home in time for Independence Day. We're back on snow after a couple of weeks at home. It snowed all day and the forecast calls for more tonight and tomorrow. Hopefully it'll stop soon as we need hard snow for training. It was good being home for a while. We only saw Bonnie briefly, as she headed to Army Airborne school in Georgia this month. But Mom was there whipping up Scott's favorite meals and smiling all the time. Scott got back into baseball and played about 10 games with his American Legion team. He really loves baseball and enjoys being part of a the team -- lots of good friends. Walking away from the line-up and repacking ski gear wasn't easy. 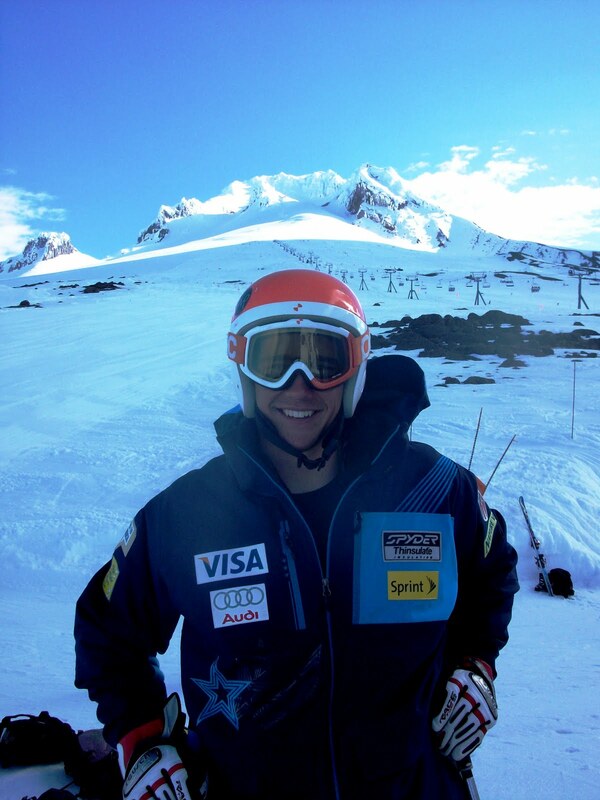 Scott's training Slalom and Giant Slalom on the glacier at Mt. Hood, Oregon. Lots of memories here as well since I used to spend 3-4 weeks per summer running race camps when he was 7-10 years old. He's staying with the team in condos 20 minutes away. I'm staying for free in the "Atomic House" where the Atomic Ski staff lives for the summer while running their equipment test center. I'm helping out as a ski technician four hours per afternoon in exchange for room, board and lift tickets. I'm working mornings on the hill with Scott and the team. Scott's been pretty calm about making the team. He smiles and thanks folks when they congratulate him, but he plays everything down. Last night the boys were issued US Ski Team uniforms. Scott called me and tried to sound calm, but I could tell he was excited. Today I saw him in the uniform for the first time and it was cool. It's been a long journey.